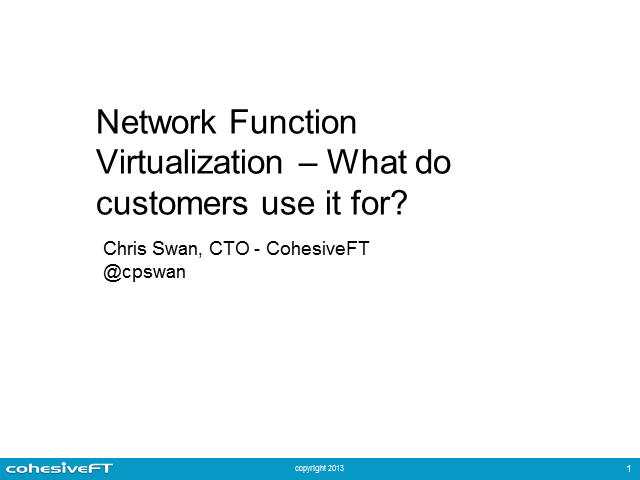 Network Function Virtualization: What Do Customers Use It For? Network Function Virtualization (NFV) is a relatively new term in the industry, but the ability to run network functions in the cloud has been around now for over five years. This presentation will begin by looking at what NFV is and does, and how it fits in with Software Defined Networking (SDN). The bulk of the presentation will concentrate on how customers use NFV to build networks that solve their business problems. By examining typical patterns that emerge from hundreds of NFV deployments a number of use cases will be illustrated. Title: Network Function Virtualization: What Do Customers Use It For?